I grew up in Aughton – that’s the bit stuck on the bottom of Ormskirk. I lived there for most of my life but Google wants to wipe it off the face of the planet! 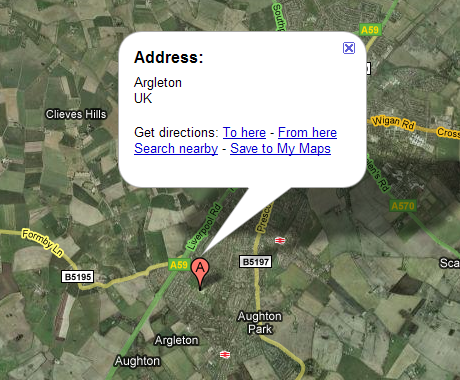 Okay, it probably doesn’t – their motto is “Do No Evil” after all – but the power of Google has renamed Aughton to Argleton. I’m not sure which gazetteer they use but either other people use it too, or other sites are using the Google geocoder as the basis of their site because you can do all sorts of things in Argleton! From jobs, to hotels – even my old primary school! As more and more “Web 2.0” services make use APIs, we’re placing our trust into a small number of services to provide good data with no clear way of challenging the accuracy of it. Please Google, don’t take away my childhood! It goes hand in hand with Dummy1325 I think! For a while St Helens was called Saint Helens on Google Maps, which is odd as I’ve never seen it writen as Saint Helens. @Mike – Indeed, OSM might know some things better, but it can be lacking in other ways. This is where you come in, be sure and take some tech to the pub tonight and record where it is! Most of the web map services routinely add a vowel in to my street name, changing both its name and meaning. Mustn’t grumble tho’ – Google completely lost Tibet some years ago – providing a handy ‘China?’ statement the last time I looked. S(ain)t Helens is a tricky one – town searches (an example being the BBC Weather site) won’t recognise it unless you get it just right, their way, sometimes down to the dot and the space. 1. anyone who purports to offer public services on the web, of any kind, and doesn’t take the widest possible approach to synonyms (e.g. L39 2TZ=l392tz=l39 2 Tz, St Helens=Saint Helens) deserves shooting. I’m trying within govt myself to ensure standards always work like this. so this is perhaps even more personal to me! I live on Dummy1325! It’s right and proper name is Smithy Lane. Dummy1325 is marked as the green on Smithy Lane in Holmeswood, Ormskirk, L40 1UH. I know I’m only a country bumkin but what is Dummy1325? some apparent typo’s and ‘wrong’ roads are actually ‘watermarks’ to aid in detecting copies of map data. ie if philips suddenly started printing maps of argleton then teleatlas/tomtom will know where they ‘stole’ their data from. so maybe argleton is one such ‘feature’? no idea about dummy1325 though…! It’s possible that Argleton is a trap feature, but I’d be pretty annoyed if it was. Aughton’s got a population of over 8,000 so it’s not exactly a trivial feature – the OS changes the style of features rather than deliberately making them inaccurate. I’ve complained and attempted to get this data fixed by Teleatlas on numerous occasions using their MapInsight tool. But I believe the tool just to be a public show of face and a bit of a joke really. It looks great, but every attempt got turned away stating not enough detail was provided. I got very detailed. Pingback: Web Services » The end of Argleton is nigh! Pingback: Web Services » Argleton goes national! its very funny i drove up there to see what it was and nothing there empty field! There are more things in heaven and earth than we know.